source which was used in obtaining it was a double line, each of whose components was double. distance apart is the same as that of the lines of curve 2. The j>eriod of the visibility curve is the same as that of 2, but instead of going to zero it merely goes to a minimum at /. Inversely, when we get such a curve as this we know that one of the lines is brighter than the other—just how much brighter can be learned from the ratio of the maximum and minimum ordinates. 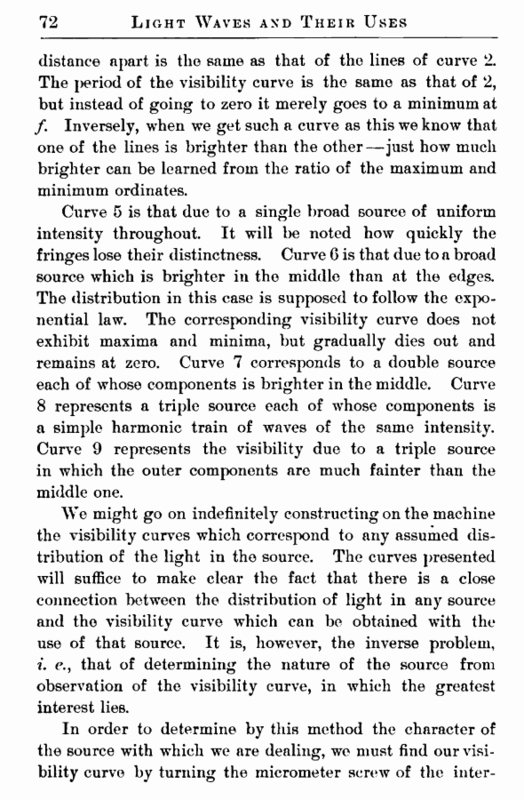 Curve 5 is that due to a single broad source of uniform intensity throughout. It will be noted how quickly the fringes lose their distinctness. Curve 6 is that due to a broad source which is brighter in the middle than at the edges. The distribution in this case is supposed to follow the exponential law. The corresponding visibility curve does not exhibit maxima and minima, but gradually dies out and remains at zero. Curve 7 corresponds to a double source each of whose components is brighter in the middle. 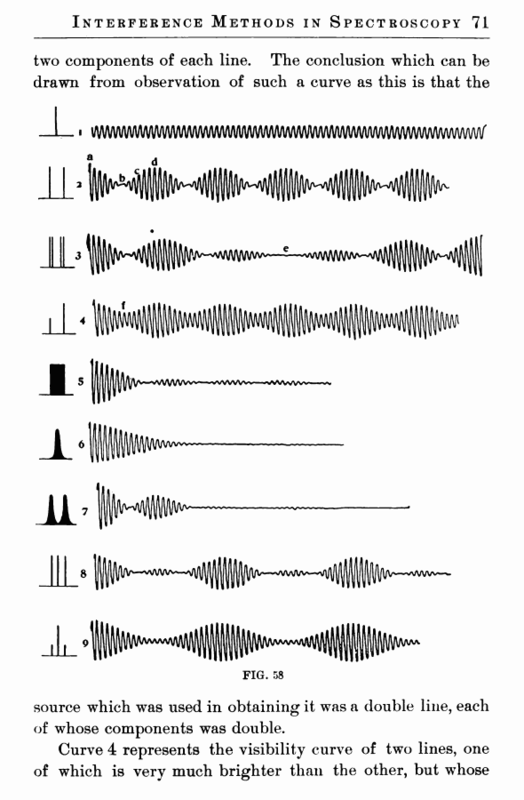 Curve 8 represents a triple source each of whose components is a simple harmonic train of waves of the same intensity. Curve 9 represents the visibility due to a triple source in which the outer components are much fainter than the middle one. i. e., that of determining the nature of the source from observation of the visibility curve, in which the greatest interest lies.